I’ve had a bear of a cold the last couple of days, one of those knock-you-on-your-cheeks deals that left me generally interested in one thing: sitting on the couch, drinking tea. Chopped and prepped ingredients, ready for a nice long simmer. But if I’m going to meet my goal of making it through one round of Nation Plates within the first year of the project, I’ve got to get cookin’ – two nations to go, and really only two weekends left to make them (as the All-American Feast will take up the last weekend of the month). So I pulled myself on the mat Saturday to make saltah, Yemen’s national dish. And I’ll tell you what – for someone fighting a cold, there was no better medicine than this. Whereas it feels like just about every other Arab country’s national dish is meat-and-rice-and-spices, Yemen was a vegetarian’s dream – not one animal was harmed in the creation of saltah – and it didn’t have a grain of anything in it, besides a few grains of salt. You’ll see that I used delicata squash in this recipe – I thought it added a nice sweetness to it, and adding a second wouldn’t hurt. It felt like it needed a bit more heft, though, so perhaps adding a small potato wouldn’t be bad, either. Also, for saltah, it helps to have some stovetop-safe stoneware pieces, which you’ll ultimately use to serve the meal. Whipped fenugreek (left) and bisbas ingredients (right) waiting to be whipped. You’ll see there are three recipes in one here – you need bisbas to make the hulba, and hulba to make the saltah. The bisbas can be used as a salsa for tortilla chips when you’re done, or a topping for an omelette. This recipe was sourced from several sites, primarily Sheba Yemeni food. After about 30 minutes of simmering, most of the liquid is gone from the stewed vegetables. Be sure to use stove-proof stoneware for the final preparation of the saltah. Grind the fenugreek, then put it in a bowl with water for at least an hour. Drain excess water from fenugreek. 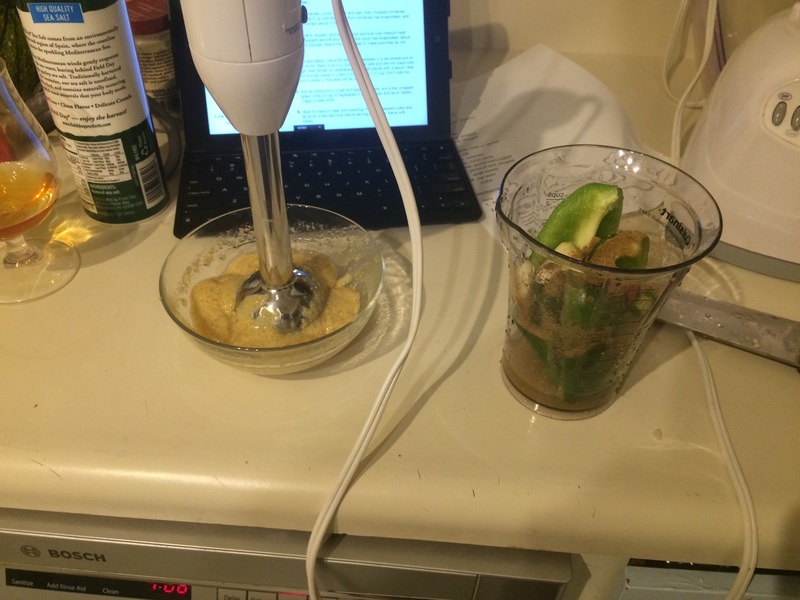 Using a hand blender, whip the fenugreek until frothy. In a blender, combine bisbas ingredients and blend until pureed. Add 2 Tb bisbas to hulba. Mix. Add more bisbas to taste. Chop your onion, garlic and chili and put in one bowl. Mix coriander, cumin, pepper and salt, and put in another bowl. Chop tomatoes, and put in another bowl. 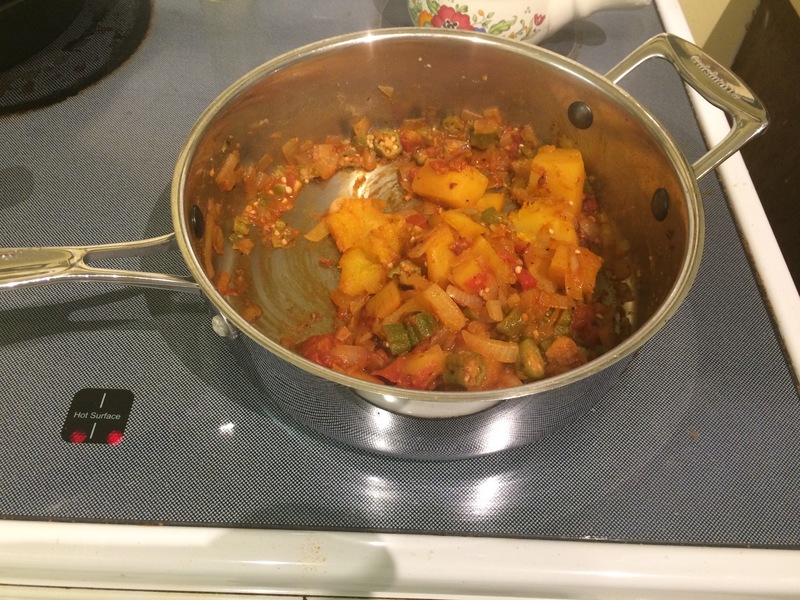 In a fourth bowl, add chopped okra, chopped squash (and optional potato) and water. Heat oil in a pan to medium heat, then add onion, garlic and chili. Sauté until onion is browned, 7-10 minutes. Low and slow is always better. Add spice bowl to the pan, then add tomatoes. Cook until liquid evaporates, about 5 minutes. Make sure you don’t run out of oil. 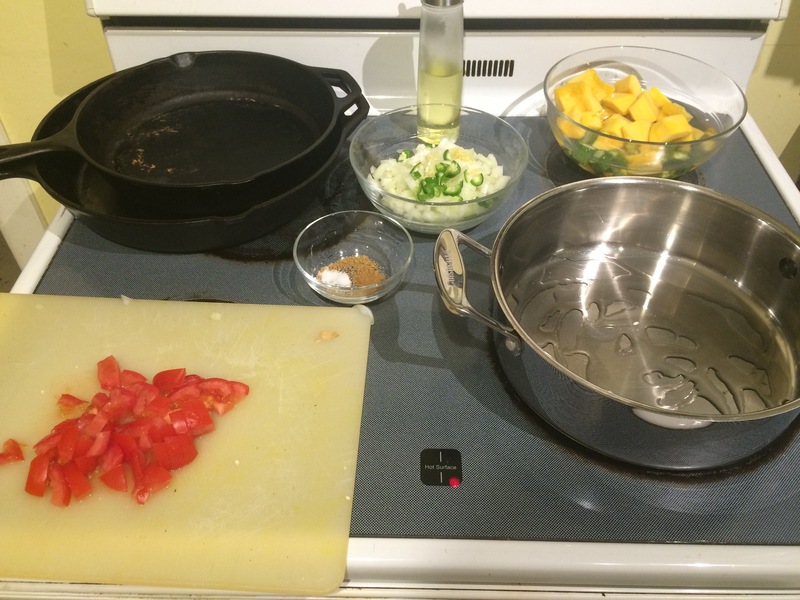 Add okra/squash/water bowl to the pan. Reduce heat to medium-low, cover and cook for at least 20 minutes, until liquid is evaporated and vegetables are soft. Stir occasionally. 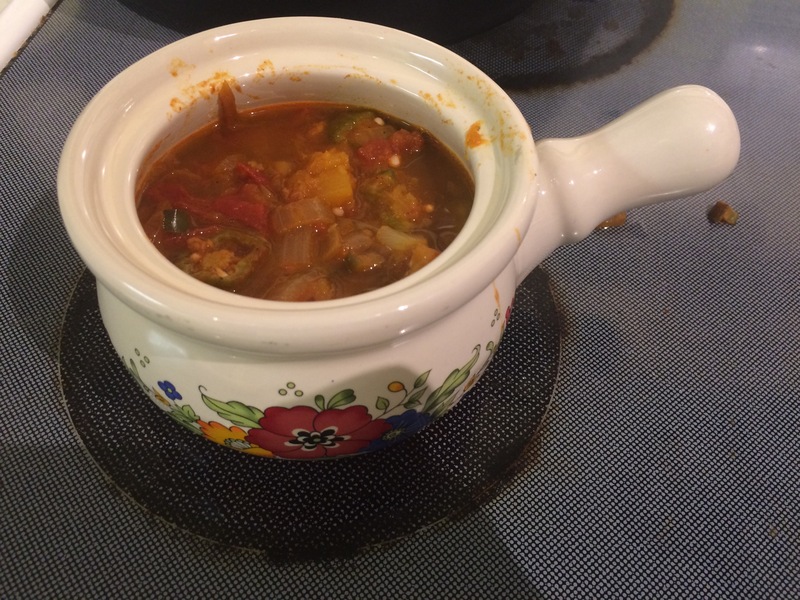 Remove from heat, and spoon equal portions into your stoneware, stove-proof bowls. Place the bowls onto burners on low- to medium-low heat. Add about a half cup of water to each bowl – remember, you’re making a thick soup or a thin stew. Optionally, add an egg. Once the saltah reaches a full boil, add the hulba on top. Once that is heated through, serve. 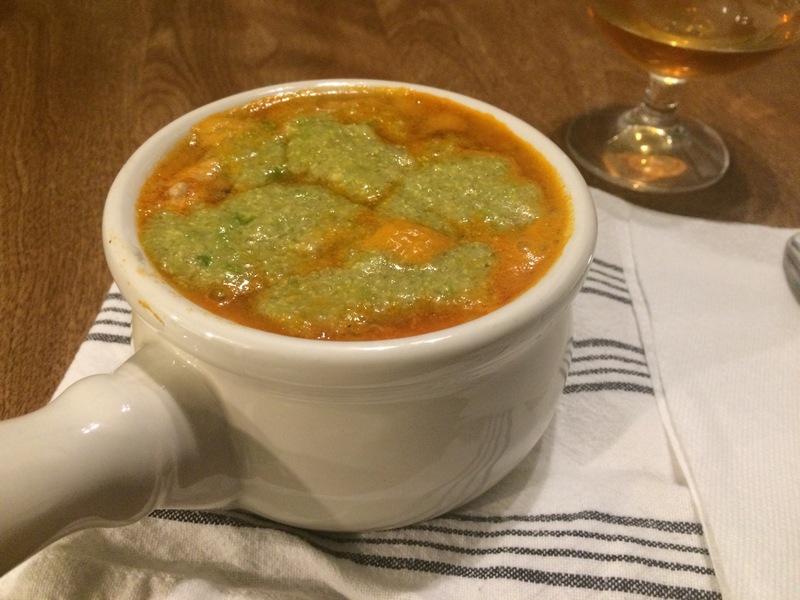 Saltah with hulba – a steamy vegetarian treat. nick, this blog is so cool! I love cooking so will be spending time trying some new interesting recipes!